The 10 meter ham radio band of frequencies has much to offer. 10 meters (28.0-29.7 MHz) offers superb long distance contacts (DX) even on very low power (QRP). An antenna for ten meters is smaller and easier to build than for any other HF ham radio bands. Most "Bang For The Buck"
In other words, here is a band on which you are likely to get the "biggest bang for the buck" than on any other HF band ... if you are looking for DX that is. Why? Sunspot cycle number 24 will be putting new life in this band until at least 2017 or 2018. How? Our sun's activity pulsates every 11 years or so. This activity is characterized by "spots" appearing on the outer limits of the sun's atmosphere. These spots are huge nuclear explosions sending shock waves of radiation in the solar system. During cycle 24, the sun produced an increasing number of nuclear explosions until about the middle of 2014. 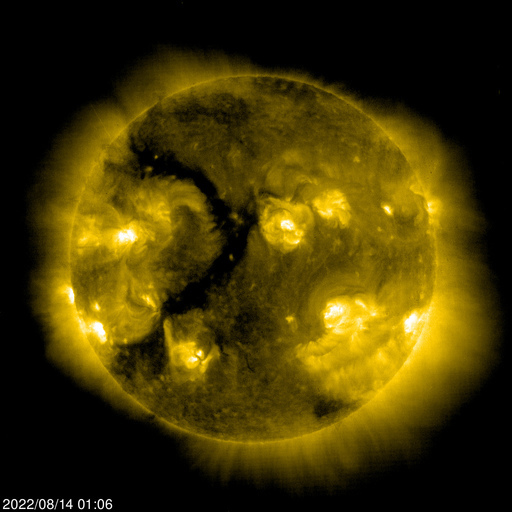 The sun's activity has now passed its peak and is slowly subsiding. Even so, there is still enough activity to produce fair to good propagation conditions, now and then. The "solar wind", generated by the sun's explosions, impacts the earth's upper atmosphere, called the ionosphere. When it does, ionized layers (called "F2" and "F1") form in the ionosphere between about 160 and 500 km above the earth's surface. The "F2" layer acts like a mirror to a 10 meter radio signal. The "F2" reflects the signal back to earth, thousands of kilometers beyond your antenna. 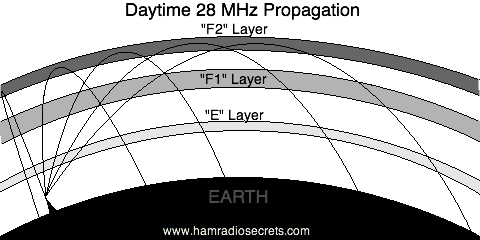 Often, the signals you hear have "bounced" a few times between the "F2" layer and the earth's surface. This is commonly called "skip". When that happens, radio signals can be exchanged between ham radio stations located on opposite sides of the earth! What's going on right now 10 meters? Find out anytime, right from your PC? During the most active years of a solar cycle, often a simple dipole will work wonders. It's easy to put one up because of its relatively small size. length (meters) = 142.4 / 28.0 MHz which gives 5.086 meters. length (feet) = 467.2 / 28.0 MHz which gives 16 ft. 8 1/4 ins. Trim it down to resonance (cut & try ... a few centimeters on each side of the dipole at a time). For example, a 29 MHz dipole will be about 17.5 cm shorter than the 28 MHz dipole. Or use an antenna tuner. The automatic antenna tuner of some transmitters might have enough capacitive range to overcome and cancel the inductive reactance of the dipole as you move up in frequency within the 10 meter ham radio band. The sun's cycle 24 activity is slowly subsiding. Yet, it will still throw enough energy toward earth to maintain the "F layer" in good enough shape, at least sometimes, to continue reflecting 10 meter radio signals until about 2019. Even during years of low sunspot activity, 10 meters can sometimes offer "DX openings". The best way to take advantage of them is to have a good 10 meter ham antenna system and an excellent receiver. 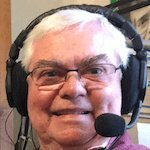 10 meter ham radio is my favorite for low power DX. It's 1.7 MHz wide! That's a big slice of radio spectrum, as much as all the lower bands put together! Lots of "elbow room". I'll see you there!